In what do you place your confidence? What qualities do you possess that you can rely upon? Are you able to put your full confidence in the God? Or are you determined to rely upon yourself? Is your righteousness a matter of your own doing, or must you rely upon God’s Spirit to prepare the way? Where then, do you put your confidence? In yourself or in God? As we continue our journey through Lent and as we draw closer to Holy Week, these questions become paramount. We continue to look inward to consider where God’s Spirit might need to do some cleanup work. The texts for this week speak to these questions. They draw our attention away from ourselves and toward God. We might find some of what we hear troubling. In an era that promotes the importance of self-esteem (and there is a place for this), we can lose sight of the vision that God sets before us. We can begin to place our trust in externals, including status and achievements, and lose sight of what God is doing in our midst. We have three texts before us – one comes to us in the form of a prayerful poem that calls us to let go of the past and take hold of God’s future (Isaiah 43). We have a word from Paul that contrasts externals with the call of God, and in the gospel reading we have the story of Mary, the sister of Lazarus (the one whom Jesus raised from the dead – John 11) and Martha, who anoints Jesus for burial. Each of these texts calls for us to lay aside the past and take hold of God’s future. The reading from Isaiah emerges from the period of the exile. Like many passages in this section of Isaiah, the author seeks to direct the attention of the people away from the past, which is painful, toward the new opportunities that the future holds for them. There is no going back to what was. The Temple is destroyed, the monarchy gone. The dreams of empire are no more. Little Judah, the remnant of Solomon’s kingdom of Israel, is a small player in a big world. They can’t rely upon their own might, but that doesn’t mean that there is no hope or no future. Yahweh is the one who makes a way in the sea. We humans try to control nature, but ultimately, God reigns over it. In putting trust in the strength of the Lord, the people are told to leave behind the past, because “I’m doing a new thing; now it sprouts up; don’t you recognize it? (Is. 43:19). This is an important word for the church today, which faces an uncertain future and is tempted to place its confidence in past glories. I serve a church that once was one of the largest in the denomination and inhabited a grand building on the main street of the city, but that is no longer our reality. We can’t go back to that past. It is gone. We must look forward into the future, for that is where God is at work, doing a new thing. Out in the desert, Isaiah proclaims, in the wilderness where one wouldn’t expect life to blossom; that is where God is doing this new thing. God will, in God’s own way, form a new people “who will recount my praise.” Is this our vision for this new era where the ability of the church to count on the broader culture to support its aims is no longer feasible? Where do you place your faith, your trust, your confidence? Do you place it in the flesh? Or the Spirit of God? The reading from Philippians 3, follows upon that of 2 Corinthians 5:16-21, where Paul spoke of no longer looking at things “according to the flesh” (kata sarka). A similar theme emerges in his letter to Philippians 3. He claims that while he has every reason to put his confidence in the flesh – perhaps more than anyone. He is, after all, a favored person. He can make a claim to being a truly religious person. He’s been circumcised (and this is the point of contention within the church), a Benjamenite, “a Hebrew of the Hebrews. He has observed the Law, is a Pharisee, and even “harassed the church.” As for being a righteous person, he is blameless before the Law (vs. 5-6). He has every reason to be proud of his religious observances. And yet, none of this matters. It’s rubbish. This renunciation of his religious achievements is rather amazing. For a society, like our own, which prizes success, such a confession goes against the grain. Like Francis of Assisi, Paul counts none of his personal assets as beneficial, placing full confidence in the call of God. His loss is his gain, the means toward the pursuit of “God’s upward call in Christ.” As I reflect on this text, I do so in the aftermath of the Catholic Church’s election of a new Pope. It’s significant that he has taken the name Francis, which bespeaks both Francis of Assisi and Jesuit missionary Francis Xavier. We have heard of his deep humility. Though being Archbishop of Buenos Aires he was afforded great comforts, he eschewed them, choosing to live in a small apartment, cook his own meals, and take public transportation. One needn’t agree with this man’s theology or positions on controversial issues, to see in him a reflection of what Paul is describing here. The righteousness of God comes not from our efforts, but from knowing God. Such a recognition puts things into perspective. It isn’t renunciation for the sake of renunciation. This is an expression, it seems to me, of what Glen Stassen calls “incarnational discipleship.” It is a vision that taps into the realism of the Sermon on the Mount so that we might engage in “transformative initiatives,” wherein we reject that which hinders the task to love our neighbor, and allows us to engage in “responsible historical action,” including what some might see as political action (Stassen, A Thicker Jesus: Incarnational Discipleship in a Secular Age, 194-195). We engage in these ethical actions that lead to justice, because we know that whatever loss we suffer is in the end a gain in confidence in the one who calls us into discipleship. In John 11, Jesus raises his friend Lazarus from the dead – not resurrection but resuscitation. It is, in John’s Gospel, a powerful sign of God’s presence in Jesus. It leads to shouts of praise and adulation. It also leads to opposition, but that’s for another conversation. 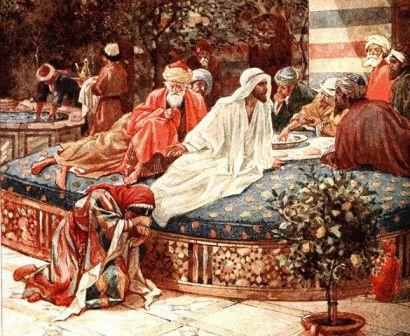 In John 12, prior to the Triumphal Entry, Jesus is staying at the home of his three friends, Lazarus, Martha, and Mary. Martha is, as has been ingrained in our thoughts, in the kitchen preparing the feast. Mary, on the other hand, does something rather audacious. In other Gospel accounts (where Lazarus’ name isn’t known), Mary is noted for her participation in the theological conversations, which is audacious enough, but here she chooses to anoint Jesus’ feet with costly perfume made of nard. Then she wipes them with her hair. This isn’t the sinful woman who tearfully wipes Jesus’ feet while he dines at the home of the less than hospitable Simon the Leper. This is a friend who chooses to let go of something precious, so that the room might be filled with this fragrance. There is, of course opposition to this act. Judas steps forward and suggests that this is wasteful. The perfume might have been sold for three-hundred denarii (essentially a year’s worth of wages). The symbolism is powerful – the loss is palpable. I think many of us might identify with Judas’ complaint. It could have been better spent on the poor. John, of course, reminds us that Judas really didn’t have the poor in mind, because he was a thief. Perhaps, in John’s mind, Judas is thinking how he can skim some of the proceeds off the top. But we must attend not to the questions of Judas, but to Jesus’ own response. Jesus commends her, because she has anointed him in preparation for his burial. Perhaps this perfume was meant to be applied to the body of Lazarus, to cover the stench of decay, but Jesus stepped in and prevented that action, so Mary, in gratitude, chooses to bless Jesus. There are, of course, messianic possibilities in this anointing – though usually it’s the head that’s anointed. In John’s portrayal, Jesus seems to see it as a prelude to his own death. It is a preparation for the coming day when he will lose his life, and yet there is also the possibility of gain. Jesus makes another comment that we need to examine. Judas complains that the money could be used to aid the poor, something that I can identify with. Jesus’ response is that the poor will be with us always, but Jesus’ time among them is limited. Some have used this text as rationale for using church funds to build elaborate buildings rather than attend to the needs of the poor. We’re simply honoring Jesus, because the poor will always be there (to receive our scraps, I suppose). But surely that’s not Jesus’ intent? In context, the point is something singular. It points to the glorification of Jesus. John, after all, speaks of bearing fruit by “doing deeds of loving-kindness” (Preaching the Gospels without Blaming the Jews: A Lectionary Commentary, p. 200). Where do we place our confidence? Do we hold on to our own devices, or do we trust ourselves to the guidance and care of the one who does a new thing in our midst, the one who overcomes death, so that we might pursue the upward call of God and bring glory to God in the course of this life?